Are Everyday Chemicals Killing Your Indoor Air Quality? Stop It Now! This year, the Washington Post released shocking information about the composition of environmental air pollution. The study, a collaborative effort between scientists, the National Oceanic and Atmospheric Administration and various universities, showed that chemicals from personal care products, craft products such as paints and solvents, pesticides and insecticides, and common household and workplace cleaning products are increasingly toxifying the indoor air we breathe. These toxins, called volatile organic compounds or VOCs for short, are showing up everywhere we go, outside as well as inside our homes and workplaces. What makes these VOCs so particularly pervasive today is that so many products that contain VOCs are used both outdoors and indoors, meaning they can migrate in either direction to toxify our air and water. Are these everyday chemicals killing your indoor air quality at home or at work? Find out and learn what to do to stop it! With the ongoing spotlight on the poisoning of our planet and efforts to stop it, phrases like “volatile organic compounds” are fast becoming household words. But what are VOCs, really? What does this phrase actually mean? According to the U.S. EPA, volatile organic compounds are chemical compounds that are typically emitted into the air in a gaseous form. These compounds are carbon/petroleum-based and can emit toxic gases while they are in use or while they are being stored. So even the innocent-appearing cans of cleaner and tubs of glue in your storage cabinets may be emitting unsafe gases into your indoor air supply. One recent study estimated that up to 40 percent of the off-gassing from these products will end up circulating in the air you breathe. Recent air quality research tells us that it is no longer enough to clean up vehicle emissions as a source of air pollution. We must take action to transform the products we rely on for work and daily life if we truly want a long-term clean air solution for our planet. There are two methods to identify the most potent airborne toxins in your home space or workplace. Take inventory of the products hiding out in your cabinets, closets, garage and workshop areas. Do you see scented lotions, sprays and air fresheners? Solvents and glues? Paints and thinners? Craft or renovation supplies? Pesticides? What kinds of household or office cleaning products do you use? Can you identify or pronounce their ingredients? Do you have an office or home office printer or copier that uses ink or toner cartridges? These are the most likely suspects for releasing VOCs into your indoor air. Conduct an indoor air quality test. If you want or need information about the exact composition of your indoor air, the indoor air quality test is the way to go. This silent 72-hour indoor air quality test will take continuous air samples over a three-day period, identifying airborne toxins and collating the data from each air sample into a comprehensive action report for you. You can use this report in multiple ways as you begin your indoor air cleanup campaign. The action you just took in Step 1 to identify your airborne indoor air toxins gives you the ammunition you need to launch the clean-up phase of your campaign. The first step to take is to transition from use of toxic products to healthier, eco-friendly products. 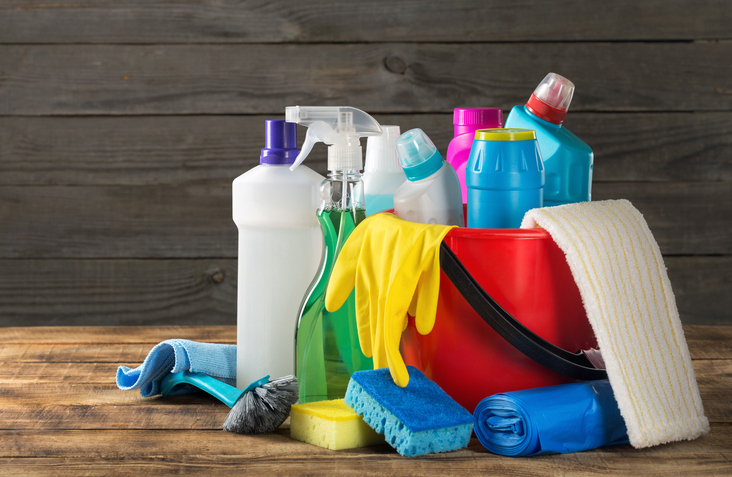 Many cleaning products manufacturers now offer safer, planet-friendly cleaning and home/office products with simple, pronounceable and recognizable ingredients. Instead of commercial air fresheners, opt for essential oil diffusers. Instead of harsh commercial cleaning products, choose natural white vinegar, baking soda and water-based products. Instead of petroleum-based commercial candles, use soy or beeswax candles. Instead of petroleum-based printer inks, use water-based inks. Now you are ready for your indoor air duct cleaning and your dryer vent cleaning. Each of these cleanings will remove potent VOCs that are trapped inside your air duct system and your interior dryer vents. The reason you want to transition out the chemical products you use FIRST and then do your indoor air duct cleaning is that you don’t want to reintroduce the same toxins into your air supply again! During Step 3, your goal is to put in place an indoor air quality process that can keep VOCs and other toxins out of your indoor air supply from here on. In other words, you don’t want to find yourself worrying all over again about indoor air quality next week! The best options to prevent further indoor air pollution and contamination from affecting your health is to install either HEPA filtration system or an ultraviolet purification system. You can choose a central (ducted) or portable (non-ducted) version of either system. A HEPA (high efficiency particulate air) filtration system traps airborne particulate matter before it can enter your indoor air supply. HEPA filters can trap tiny particles as small as 1/100th of a single human hair! A UV filtration system uses ultraviolet band-C, the most potent type of UV light, to zap particulate toxins before they can enter your indoor air supply. It is always a great time to improve your indoor air quality! Contact us online or give us a call at 905-544-2470 to discuss your air quality concerns and set up your initial consultation!